Hi there! Well, I’m feeling elated after yesterday’s big SCOTUS decision, and wanted to pass on my recent update via Joyfully Jay. 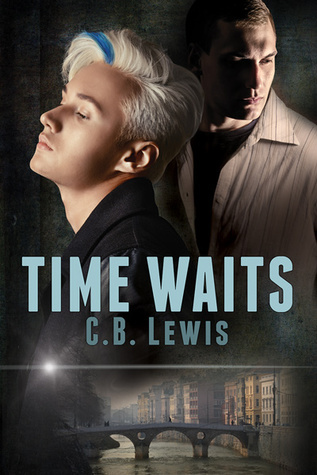 This week, I shared my review for TIME WAITS, a fascinating near-future time-travel M/M romance recently released by a new author to me, CB Lewis, and Dreamspinner Press. Badly wounded and on the run from his WWII Hungarian brigade, Janos Nagy stumbles through a temporal gateway to the future. Suddenly stranded in Manchester, England, 2041, Janos wants answers about a crazy world he doesn’t recognize. Dieter Schmidt, flamboyant historian/linguist for the Temporal Research Institution has those answers, but the TRI is a neutral entity, set up to verify historical events under a strict code of noninterference. That doesn’t stop Dieter from taking Janos under his protection. Trust doesn’t come easy to Janos, who came from a time when revealing his secrets could get him killed, but the two men slowly build a tentative friendship with a possibility for more. But Janos’s continued presence in the future and Dieter’s persistence raise questions about the limits of the noninterference policy. Since the rules have been bent once, one agent sees no reason why he can’t push them further, and he travels back to 1914 to make a few changes of his own. Under Janos’s guidance, Dieter must leap back in time to stop the rogue agent from changing the past and risking everyone’s future—if he can survive history. I really liked the idea of this book and felt like it was well-executed. The romance between Janos and Dieter is slow to build and develop. Each man experiences an attraction he feels is wrong—Janos due to ingrained homophobia and fear, Dieter because he feels like he’s taking advantage of a man trapped in time. Dieter and Janos were fantastic characters. They have a real chemistry that simmers. Dieter is required to retrieve his fellow time agent, and he’s intellectually prepared for a job that he is physically untrained to perform. He’s never BEEN on a mission, and his own mother was lost to a time incident, but Dieter is determined to do this right. It is heartbreaking for Janos to have to train him, both of them knowing that this time jump will likely separate them forever, even if Dieter is successful in his mission. Check out my entire 4.25 star review on Joyfully Jay Reviews. Time travel… I have issues with time travel… Glad to hear that at least the romance side of the story worked for you.